Excipients: Maltodextrin, Colloidal Anhydrous Silica. Core: Croscarmellose Sodium, Magnesium Stearate, Silicified Microcrystalline Cellulose, Talc and Silicon Dioxide. Coating: Hypromellose, Talc, Titanium Dioxide, Macrogol, Saccharine Sodium. 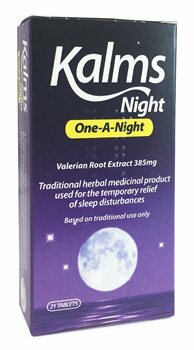 The recommended dose is one tablet 30 to 60 minutes before bedtime. If necessary, on subsequent evenings, swallow 1 additional tablet earlier during the evening. Not recommended for anyone under 18 years old. As the effects of this product may not occur immediately, the tablets should be taken continuously for 2-4 weeks.